One of the first things that struck me about Outlandia is how it remains something of a secret. Few people seemed to know exactly where it was and what exactly it was for. Even finding the treehouse structure became something of an adventure, building up my expectation of what it would be like. This sense of anticipation is further heightened as you finally come across the sign for Outlandia at the beginning of a floating wooden walkway which guides you slowly through the dark forest on the final part of your journey. 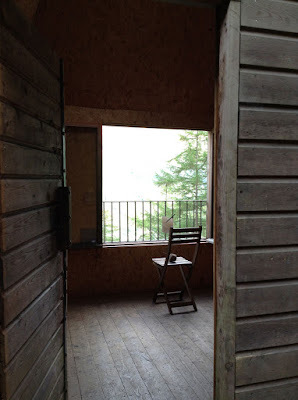 Despite, or perhaps because of this hidden and uncertain quality, you do get visitors, and this slow stream of unexpected ‘guests’ reminded me of other residency situations where the artist can become something of a curiosity, an exhibit even - in this case framed within the wooden architectural structure. In a heightened state of (self)consciousness this sense of theatre worked its way gradually into my thinking as I struggled to make sense of the amazing physical location of Outlandia. My initial proposal asked about ways of making connections with the mountain landscape. Was the lookout architecture an aid or a hindrance in this respect? A breakthrough came as I began to construct rudimentary devices capable of holding pen and paper. With open windows and wind assistance these devices began to slowly perform uncertain movements intimating scribbled drawing or shaky handwriting. 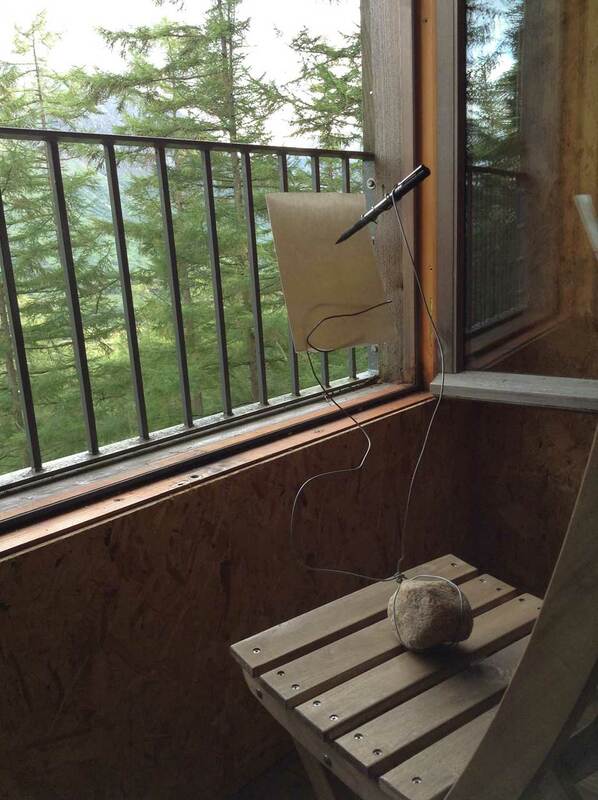 I left one such device (made from pig wire and stone) balanced on the studio chair looking out towards Ben Nevis, free to do its thing - free to be discovered by unexpected (and unsuspecting) guests: the artist as automaton. I call this work Waiting for Nature to speak to me. (folly). Later on, I took these basic devices further up Cow Hill to make more elaborate gestures in the open air. We had a great time. 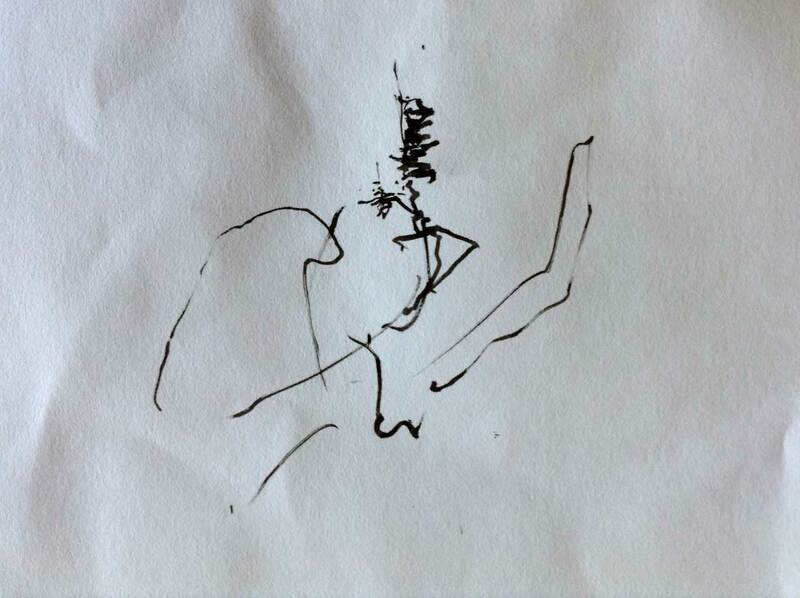 I would now like to further explore these ideas by testing the dynamic possibilities between object (sculptural device), activity (mark making), the physical drawing (paper) and documentation (video or photograph of set-up). Even though there is no real connection between what is drawn and the view (or backdrop), I’m interested in the way the viewer is compelled to make meaningful connections between drawing and landscape. It is this aspect I would like to research further through exhibition and documentation.